These are just some of the traps young women, and also in many cases their parents and teachers fall into when thinking about engineering and other science, technology, engineering and maths (STEM) professions. There are a couple of reasons it matters that only 11% of engineers are female. For one, the gender pay gap in Australia currently sits at 82 cents to the dollar (female to male earnings). Much of this can be attributed to the underrepresentation of women in higher paying careers like those that make up the majority of STEM professions. The problem is that girls, at a higher rate than boys, are electing not to study maths and science in senior high school, compounding to fewer women pursuing STEM careers. This is important because 75% of the world’s fastest growing careers require STEM skills, so in order to make sure today’s girls aren’t left behind we need to close the gender gap in relevant subjects. Second, STEM professions predominantly are tasked with solving some of the worlds’ toughest challenges and are a great driving force for innovation. Importantly one of the key ingredients necessary for innovation is diversity. This means we need to engage gender diverse thinkers in these subjects. My point is about the skills students learn from pursuing STEM subjects (even just from taking maths and science subjects at school). These are skills that will enable them to become suitably qualified for a broad range of careers. The skills I’m talking about are not the obvious ones like understanding the bending moments of beams, or knowing what ‘super laminar flow’ means. I’m talking about skills like critical and creative thinking, problem-solving, communication, leading teams. These are the skills I firmly believe we need to equip today’s students with to effectively prepare them for future careers. The beauty of maths and science is critical thinking: How to come across a problem, critically evaluate it, break it down, think about the knowledge and other resources at your disposal and come up with a strategy for an appropriate solution. The percentage of girls studying no maths at all for the Higher School Certificate increased from 9.5% in 2001 to 21.8% in 2011. Only 13.8% of girls took one maths and one science subject for their higher school certificate in 2011, compared with 18.6% for boys. At the same time only 1.5% of girls studied advanced maths alongside physics and chemistry. Overall participation rates of girls in Advanced Maths have steadily declined (16% in 1994 to 9% in 2012). For every 25 males there were only 14 females studying this subject. Overall participation rates in Physics have steadily declined (21% in 1992 to 14% in 2012). By 2012 there were three times as many males studying Physics than females. These are terrible statistics and indicate a dire need to do something. When people think of engineering or STEM careers, they often think, similarly to Emmy, that they need to be super smart, or great at maths to succeed. It’s going to take a community-wide shift in the conversation about STEM to bust these myths, starting one person at a time. Emmy’s context for maths stopped her from pursuing her dream of becoming a medical engineer. But as a nurse she uses maths and science every day, from administering medications to checking heart rates. As influencers, we need to think about how our own context for maths and science impacts the way we talk about it with other people, particularly young women. Consider that you have a choice when talking with young people, to either inspire them or to teach them that maths and science are hard. Parents can help their children to adopt a growth mindset towards maths and science subjects and encourage the joy of having a go and learning from failures. Teachers are now increasingly embracing resources that help them connect maths to the real world, which is great, we need a lot of this. We need students to see the relevance of what they are learning in class to their futures, and to discover how the skills they are learning will be useful for whatever future they pursue. We can all embrace the idea that the skills we learn from science and maths are core skills that will help prepare young people for the careers of the future. Let’s pass this idea on to the next generation. Engineering is about creating solutions for communities, helping people, and making a real difference in the world through maths and science. An engineers’ job can range from devising water sanitation solutions for developing communities, through to creating prosthetics for people who have lost limbs. Girls don’t need to be the best at maths to do this, that isn’t even important. What is important is that they have a go, they learn something and they don’t close themselves off to an opportunity because they think it’s too hard, or a job for men. Jillian Kenny was named as one of 2014’s ‘100 Most Influential Australian Women’ by the Australian Financial Review and Westpac. Jillian’s passion for providing opportunities for non-traditional entrants into science, technology, engineering and maths professions has led her to establish two social enterprises serving this space. In 2012, Jillian co-founded the non-profit organisation Power of Engineering which runs nationwide events for female and regional Year 9 and 10 students to inspire them about the engineering profession; showcasing it’s diversity, creativity, and most importantly that it is an avenue to making a real difference in the world. Jillian also started Machinam which develops innovative mathematics resources for high school students. 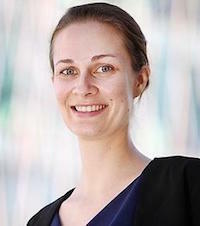 Jillian has a Bachelor of Civil Engineering and is currently in the final stages of completing her PhD at Queensland University of Technology.